Ratra's Dental is one of the few best dental centres in india to provides you with caps crowns & bridges with upto 15 years of warranty. only dental centre with the widest variety of dental crowns like metal, pfm,metal ceramic, metal free / all ceramic , 3m essentialtm, 3m lavatm ,royal crowns...... Our in house dental lab support can change your smile within few hours. Our smile designing procedure can help you get confident smile by veneers, caps,laminates,bridges & implants.we offer best solution to missing teeth at a very reasonable cost. At Ratra's Dental we pride ourselves in our team approach. 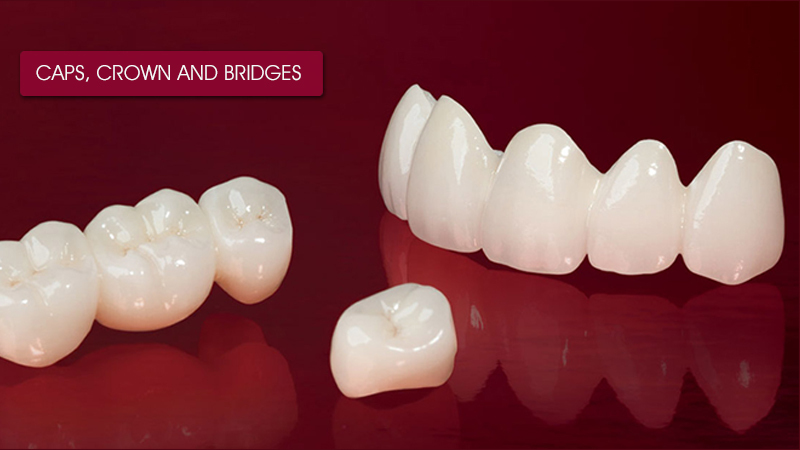 we believe that constructing a crown is a combination of technical expertise and artistic flair. From the outset we involve our highly skilled technician in the planning and designing. We encourage as much communication as possible among the patient, technician and dentist to ensure that the final result is exactly as expected. In case of failure to replace a missing tooth, you could end up loosing all your teeth. Each tooth has two parts - Crown and Root. Crown is visible in the mouth whereas the root is embedded in the bone. Molars have two or three roots whereas the front teeth are usually single rooted. As shown in the picture extraction of a lower molar has created a space Â´XÂ´ . Upper tooth 6 is now useless because it no longer has a tooth to chew against. Therefore loosing one tooth can result in the loss of two or more teeth. Back teeth have a lifetime tendency to TILT and DRIFT towards the front of the mouth. Thus in the above case the lower 7 is drifting and tilting forward. A tilted tooth develops a Gum pocket along its front tooth. Gum pockets are narrow abnormal spaces or clefts that develop between the gums and the tooth root. These pockets trap food debris and bacteria. A gum pocket is a problem as it is very difficult to keep it clean, even with the best brushing and flossing. The debris and bacteria that collect in the pocket lead to worsening of the gum infection. This gum infection finally infects the adjacent bone which softens and slowly begins to disappear. Thus the lower is lost due to gum infection and the upper 6 and 7 eventually lost because of tooth decay and infection. Dental crowns, also referred to as "dental caps" or "tooth caps," are dental restorations that cover over and encase the tooth on which they are cemented. Dentists make use of dental crowns when need to rebuild broken or decayed teeth, strengthen teeth, or improve the cosmetic appearance of a tooth, Placing a dental crown on a tooth that has had root canal treatment. Crowns can be made out of porcelain (meaning some sort of dental ceramic), metal (a gold or other metal alloy), or a combination of both. Other terms that are used to refer to dental crowns are "dental caps" and "tooth caps." Since a dental crown that has been cemented into place essentially becomes the new outer surface for the tooth it is easy to imagine how the placement of a crown can restore a tooth to its original shape. Dental crowns are routinely made for teeth that have broken, worn excessively, or else have had large portions destroyed by tooth decay and also for teeth treated by root canal treatment as inside of teeth becomes slightly weak as compared to healthy teeth. What a disappointment it would be to spend the time, effort, and money to have root canal treatment performed, only to have the tooth break or crack irreparably before it was fully restored by dental crown. Sometimes teeth have been so badly damaged by decay or wear that cosmetic fillings are no longer a viable option. Under these circumstances the tooth can be saved and protected by a crown or a cap. Occasionally, patients who have crowded or malaligned teeth and who are unable to commit themselves to orthodontic treatment can have their problems solved by the use of crowns or veneers which can be used to disguise the appearance of the teeth and provide a beautiful smile for life. How can dental crowns strengthen teeth? The strengthening capability of dental crowns is related to the fact that they cup over and encase the tooth on which they are placed. This means that a crown can act as a splint that binds a tooth together. This is a very important feature of dental crowns and one that makes them a very valuable type of restoration for a dentist to have available to them.